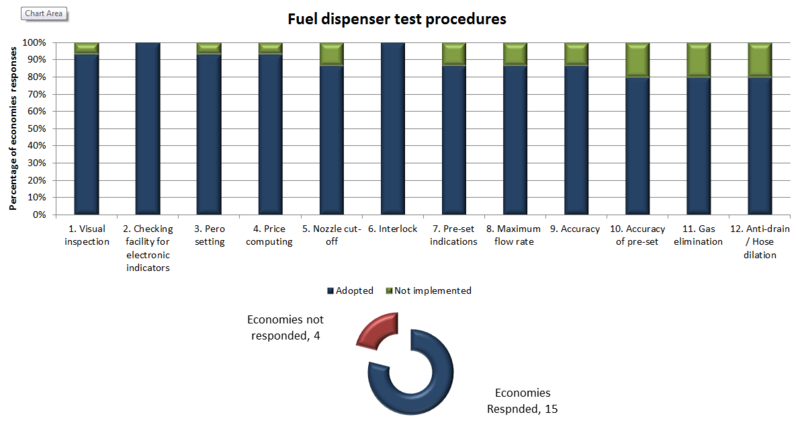 ​Please note tests used to compile this summary are fully described in the document 5.1 NITP Verification of Fuel Dispensers. Inspect the fuel dispenser for compliance with any relevant regulations/environmental factors/mode of use. This test can be carried out in conjunction with the test for zero setting using an electronic reset mechanism. Carefully return the nozzle to its hang up position and ensure that when the nozzle is then removed no further deliveries are possible without the segment test being initiated and the indications returning to zero. Compare this calculated price with all price displays. Repeat above steps twice more. b) without separate unit price display: the unit price display for the hose selected is displayed and all other unit price displays disappear until the delivery has been completed. Check that all other hoses sharing the same indicator are disabled by removing the other nozzles from their hang up position and confirming that they do not authorise. Select and authorise any hose that shares the common pumping unit with the hose being tested. While the pumping unit is operating, attempt to make a delivery from the hose being tested without allowing the dispenser to be actuated where it will initiate the zero setting sequence. Check that it is not possible to make a delivery from the hose being tested. Check that the price/volume indication on the display corresponds to the pre-set amount and for self-serve remains on the display or is stored in memory until the transaction is finalised. *Only performed at initial verification, or when any site changes occur. With all hoses operating at the maximum achievable flow rate, time the delivery for one of the hoses. Stop the delivery after at least 10 seconds and calculate the flow rate. Calculate and record the relative error (of indication) (EFD = (VFD-VREF)/ VREF x 100). Calculate and record the relative error (of indication) (EFD). Determine the error difference (ED) for the gas elimination device. Stop the delivery suddenly by immersing the hose nozzle into the delivered liquid or by suddenly releasing the trigger of the nozzle. Close the nozzle when the flow stops, or after 30 s. If the nozzle still drips after 30 s the nozzle should be repaired.